What would normally take five weeks to prepare took only eight days for choreographer Stephanie Ballard and students from the School of Contemporary Dancers. The VERGE Dance Dialogues performance debuted on Feb. 8 at the Rachel Browne Theatre. The show explored history, time, and the conversations between different generations of dancers. “A four to six-week process is the norm for a full length, including choreographing it and rehearsals,” said Ballard. Subdued, rough exhales were heard over the music while a dancer stretched his arms outwards to the sides, spun, and fell to the floor. A projector filled the back wall with a film prepared for this dance. 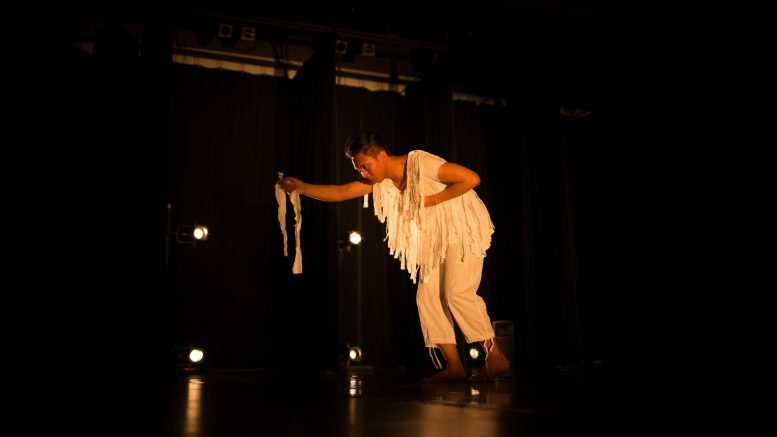 The dark stage at the Rachel Browne Theatre was level with the audience, which allowed the dancer, Mark Dela Cruz, to approach the edge of the stage and present Ballard, who sat in the front row, with a strip of white cloth, a piece of his costume for this part of the performance. VERGE Dance Dialogues, organized by Winnipeg’s Contemporary Dancers, is a chance for students and recent graduates of the School of Contemporary Dancers to work with an accomplished choreographer to co-create a performance. According to Ballard, its a stepping-stone between finishing school and starting to dance with a company, or to dancing at a professional level. The performance explored the idea of time by projecting pre-recorded footage on the wall behind the dancers while they performed. The performance started with a slideshow featuring historic photographs and newspaper articles relating to the dance community in Canada. The slideshow was followed with a commentary by Ballard on the history of contemporary dance in Canada. “I’m creating a new atmosphere that really deals with lineage and legacy,” Ballard said. After Ballard’s speech, the dancers took to the stage and performed a number of pieces, more than half of which included projections on the wall that were prepared in part by guest artist Kayla Jeanson. Jeanson said that Ballard had a lot of creative control in the filming process and it was not until the editing process, along with looking at Ballard’s past work, that the connections between the film and the choreography start to become apparent. “She was getting us to re-enact things that other dancers had been doing before,” she said. The closing piece paired a film of the performing dancers moving from dramatic lighting into silhouette, with all of the dancers performing on stage. “At first you see their faces, and then they walk and it turns to silhouette, and it has this layering effect of time and past selves, and it just felt right to explore that with that illusion created,” Jeanson said. She said she embraced Ballard’s way of making connections across time to create her film piece.